I just can't get enough of making brooches!! This is the last brooch I promise! 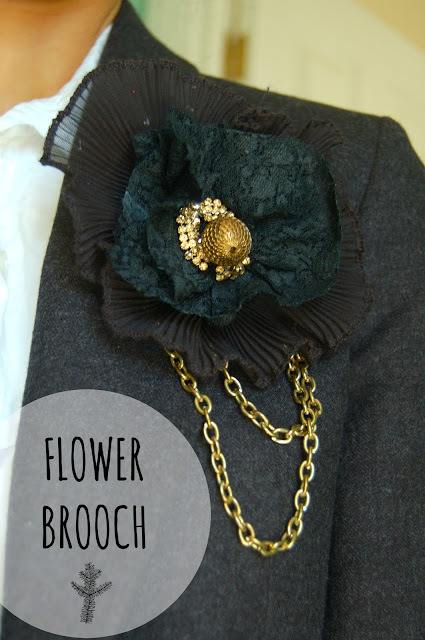 I started off this brooch using 2 scrap bits of fabric: old lace and the end of an old scarf. To begin with I cut these pieces of fabric into a long triangle. To achieve the shape of each flower I did a simple running stitch by hand along the longest side of the rectangle and pulled it tightly. (This is a very simple way to achieve a flower shape). I then stitched the flowers together and added some old jewellery onto the brooch- an old necklace loop, a big bead and part of a bracelet around the bead.